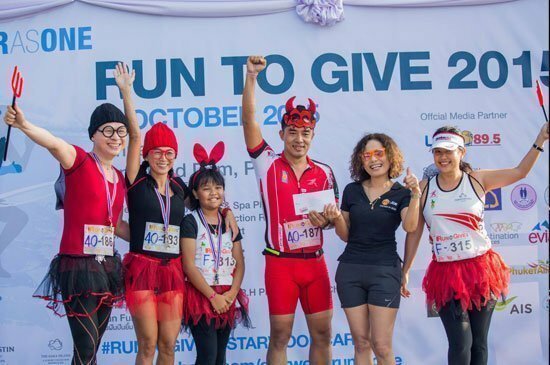 Phuket, Thailand – 19 October 2015 – The Westin Siray Bay Resort & Spa, Le Meridien Phuket Beach Resort and The Naka Island, A Luxury Collection Resort & Spa Phuket, pleased to announce the successful funding of Starwood Hotels & Resorts annual charity run event “Run to Give”. On 11th October, 2015 at Bang Wad Dam – Kathu, Phuket total of 1,555 runners turn out for the event, 1,093 people for the 3km race and 462 people for the 10km. Funds raised through the charity run in Phuket scheduled to donate towards three local charity projects by 21st October, 2015- in total of 100,215 Thai Baht to Koh Siray School, 177,000 Thai Baht to the lunch project initiated by H.R.H Princess Maha Chakri Sirindhorn and 177,000 Thai Baht to the Pan Fun Pan Yim to support the less fortunate children in the communities.